Cold Steel Recon 1 XL — O’ Brother where art thou ? 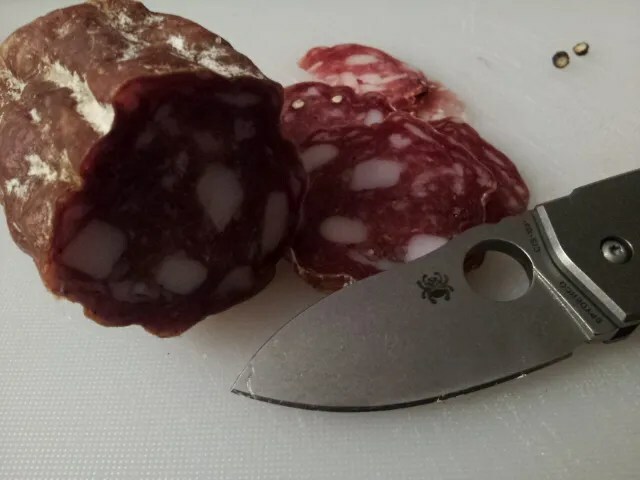 Everything I could have said about that knife is already in my XL Voyager Review here ! Really, you should start by that post. This Recon 1 XL version is just proposing some real great upgrades. 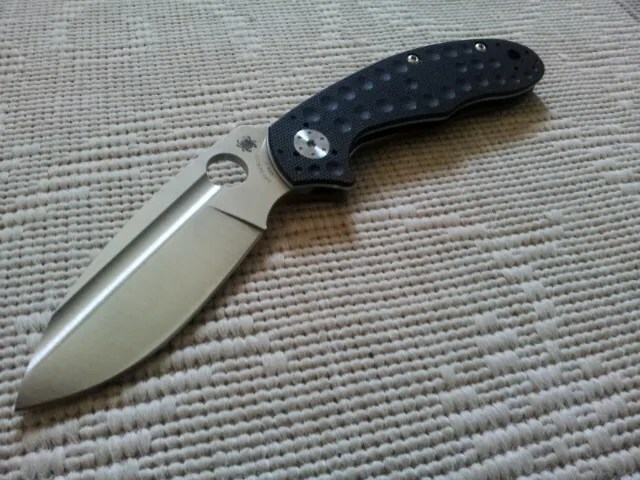 Compared to the Recon 1 normal version: this is a full flat ground bowie blade when the other version is hollow ground. The DLC coating is really really nice and not easily scratched like the goo paint used before. 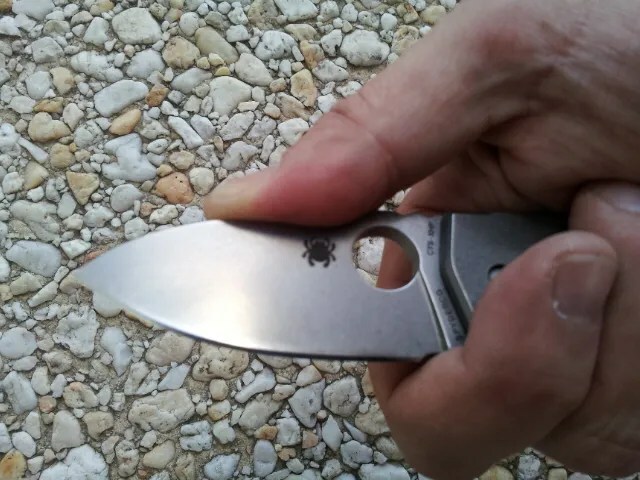 The CTS XHP made by Carpenter is a wonderful alloy I have had first discovered on the Spyderco Techno. But here you got 5,5 inches of steel !! G10 is more luxurious than Grivory and it’s easily sanded to your preferences. My Recon 1 XL could have been used as a wood file as the G10 was too grippy for my taste. G10 is so solid, you can make blades in G10, it doesn’t need any liners. The result is a very light package. (My Voyager XL got aluminium liners). Sanded the G10 turns white but is cleaned back under tap water. The clip is not useable. anyway clipping such a knife is not the easiest way to carry it. It disappear perfectly in a deep pocket or in my case in my travel bag. I would be able to EDC my K2 but this voyager asked for a vest or a bag. The detent is smooth. even a little too smooth to my taste. But nothing to worry about. The knife can be open with a gentle flick of the wrist as the heft and momentum is important with such a blade. Again, like all CS blade I have chosen and which are manufactured in Taiwan: the thin edge is remarquable. That monster blade slits plastic, wood and flesh with an uncanny ease. There is a lot of power in the cuts. And all is served with their Triadlock which is the Mega lock by excellence. There is zero play in any direction. The knife is fantastic, this is a dream for Crocodile Dundey ! It also perfectly balanced with it sweet point two centimeters behind the axis. This blade is alive and fast in your hand. I was able to import that big bad baby for less than 100 euros including shipping. Talking about power/price ratio, huh ? Posted on 07/08/2017 27/08/2017 Author nemosandmanCategories Folders, UncategorizedTags Cold Steel, CTS XHP, Recon 1, Taiwan, Techno, Triadlock, XL3 Comments on Cold Steel Recon 1 XL — O’ Brother where art thou ? 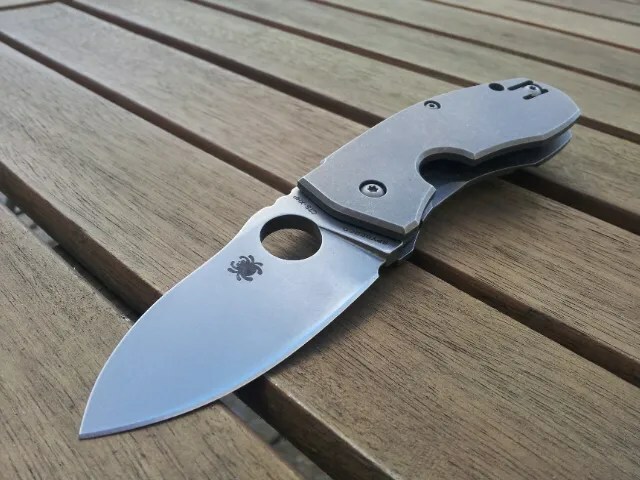 Spyderco Techno C158TI – Is it my fav’ EDC ever ? Of all the knives I have ever owned this one is blending everything I love in a knife. IMHO this the perfect EDC. 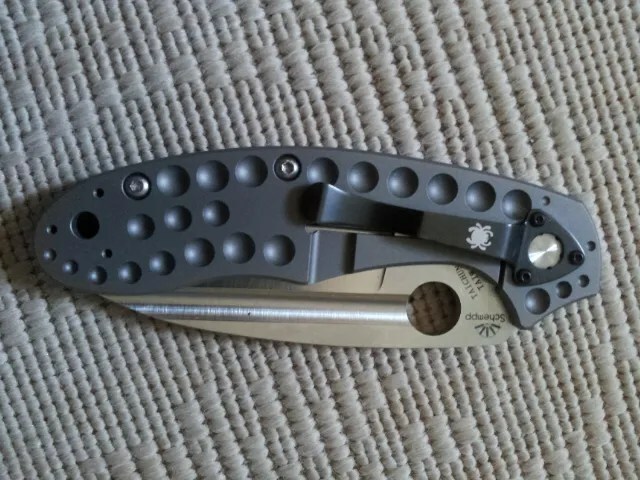 And as I have stated in various reviews, since the 90’s, I always wanted a Sebenza with FFG and a Spyderhole… Marlin Slysz should have heard my wish. 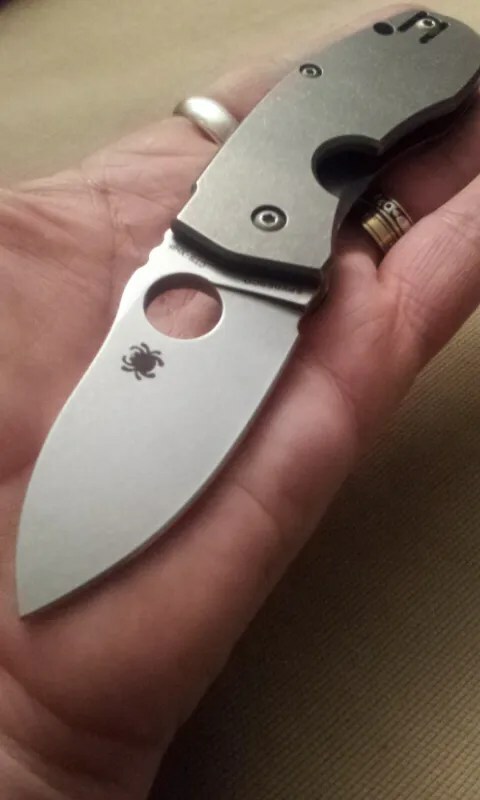 The Techno is one of Spyderco favorite concepts : a “Little Big Knife”. Really. A thick blade like a Lionspy. Strong Chris Reeve Integral lock. Titanium construction with strong blade steel… Thick is good in my book if it’s not killing the perfs. Nordic knives like Pekka Tuominen extraordinary Nilakka tend to be thick and sharp. This is not common as many “tactical” folders emphase the thickness and forget the sharpness. 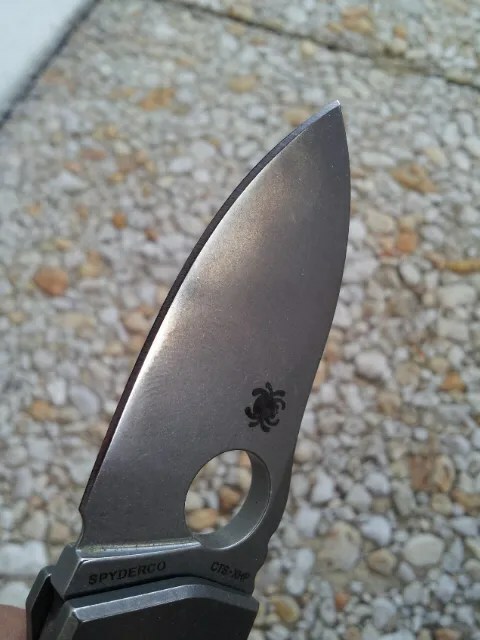 But Spyderco has always been really performance obsessed. So the Techno is thick. Thicker than the Tuff. The back of the blade is an invitation for your thumb to push. This is really pleasant to whittle with the Techno as the thumb is not soared. Handling the Prototype, I thought then, the blade was not enough pointy to my taste. I was wrong. My Techno got enough penetration power to gently pierce plastics. Not as Pointy as my C36 Millie. But much more solid. The Techno is performance oriented: the full flat ground (FFG) blade got a thin edge which is incredibly aggressive. As far as I know, Carpenter’s CTS-XHP is becoming one of my favorite cutlery steel. I was not able to really dull the Techno’s edge since I got it. I’ve got some minor factory edge rolling after using it on a plate and it has been cured in 10 secondes on white ceramic. Since I receive it the Techno have never let me down. It was razor sharp and stays razor sharp. What more do you ask from your EDC? Ergonomy. Yes. No choil on this one but some kind of hidden choil which means plenty of room for a strong 4 fingers grip and a great Blade/handle ration. Everything is designed for high reliability and usefulness. Closed in your fist, the Techno disappears and is warm to the touch. Its weight is pleasant as it is oozing high quality from its titanium pores. No hot spot on the handle. Nothing to file or to sand. The Techno is blister free and much more ergonomic than my beloved Sebbies for example. Pleasant to the eye also: the bead blasted handle and blade is giving your tool some hardchore background. 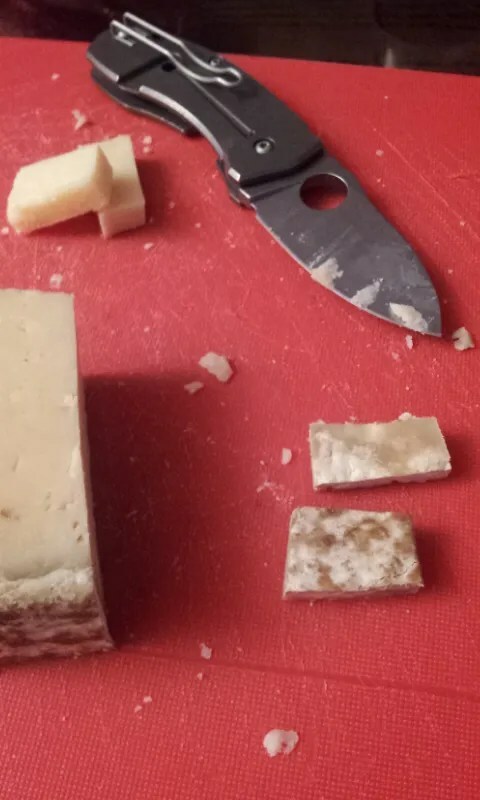 This knife is for serious cutting business. 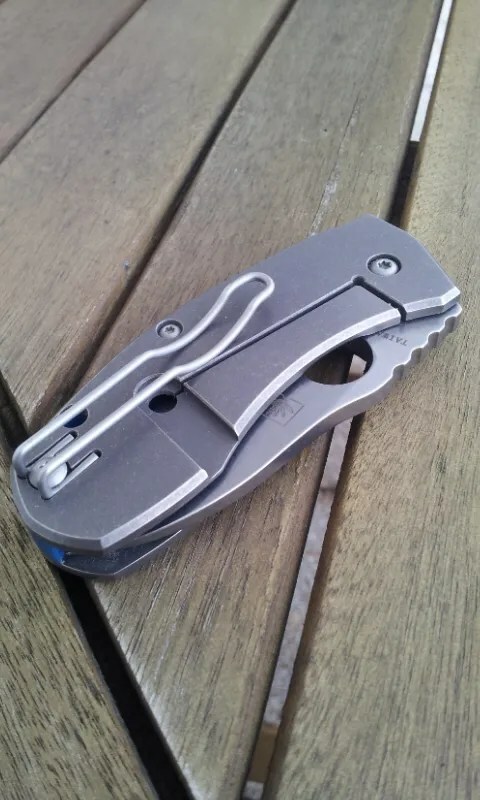 Bushcrafters of the world, again, this is a folding tool to consider. There is even a lanyard hole to secure your Techno ! Anyway, the Techno is easy to carry: equipped with the deep wire clip, the knife once clipped look like a… some kind of lighter. 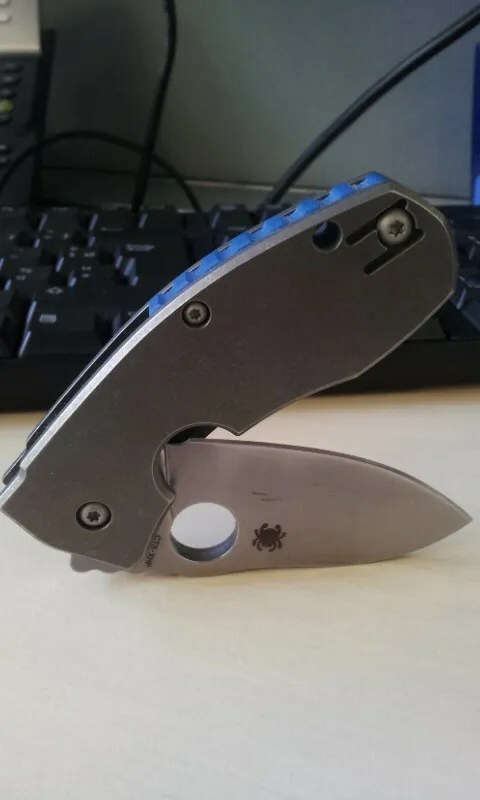 The blue G10 spacer helps a lot in giving some friendly image to the Techno. 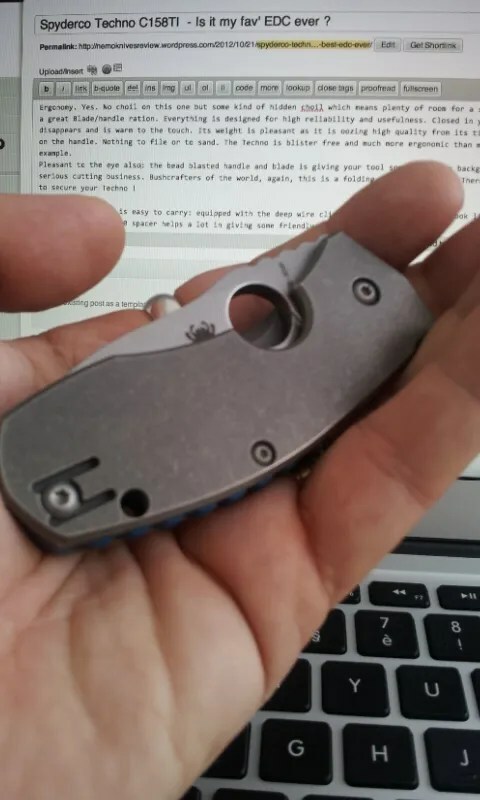 Sh*t, the Techno got A+++ on all the requirements to become my favorite EDC ever… Now time and mileage will tell… So far its concept corresponds to something I’ve really been looking for: some strong “toolish” character + some real cutting performances in a small “easy to EDC” package. 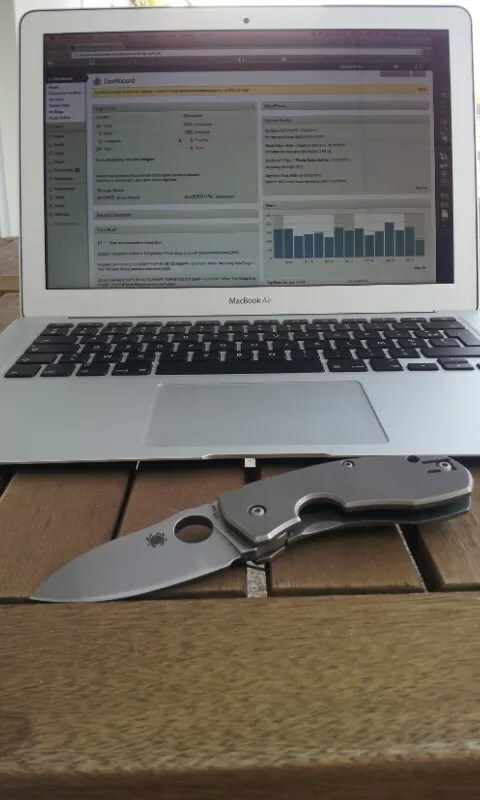 Posted on 21/10/2012 Author nemosandmanCategories FoldersTags Marlin Slysz, Spyderco, Techno6 Comments on Spyderco Techno C158TI – Is it my fav’ EDC ever ?